Despite what you might think, pom pom crafts are fun for kids and adults alike. Incorporating colorful pom poms into your DIY projects adds a sense of whimsy to your designs, and it's relatively inexpensive to do. Before you tackle some of our favorite pom pom crafts below, first learn how to make your own pom poms to save money. One of the easiest projects on our list is actually one of the most wearable. Some simple plier skills will help you make these bright earrings with minimal effort and supplies. Read the tutorial, head to your local craft store, then get started! If you aren't the best at decorating birthday cakes, consider crafting a simple cake topper instead. You'll get a Pinterest-worthy cake without all the fuss with frosting. Use small wool pom poms for this project and keep your word short and simple. Pom pom garlands are a popular way to decorate mantels and work well as party decor. However, have you ever considered making a gigantic pom pom garland instead? The oversized garland stands out much more than a smaller sized one would, so you get more bang for your buck. This pom pom project has multiple uses and would work great in a dorm room. Pom poms are transformed into magnets and then adhered to a metal desk lamp. The great part about this design is that you can keep the magnets on the lamp but then also remove them to use on a bulletin board as needed. Pom pom crafts aren't always multi-colored and loud. In fact, this strand of pom poms added to a placemat is quite elegant and refined. To create a more traditional look with pom poms, use one color and keep them small and layered. Decorating for a party doesn't have to be intimidating and take up a ton of extra time. Bring party decor to the next level by simply gluing mini pom poms onto balloons. Pick a variety of jewel-toned colors and keep the pom poms evenly spread throughout the balloon. Upgrade a simple canvas or wicker laundry bin by adding large-scale fluffy white pom poms. Keep all the pom poms roughly the same size and make sure they are evenly spaced. You can either buy really expensive pillows with pom poms already attached or you can make your own for a fraction of the cost. If you're going for a bohemian vibe, make sure you add a variety of textures and colors to the pillowcases. Then go bold with the pom poms. Make them large and contrast the color. This next pom pom craft is fun to tackle with kids since it's easy and colorful. Create or purchase a variety of pom poms in different colors and sizes. We like the pom poms here that are multicolored. Next, arrange your pom pom's onto a wreath base. Make sure you try to replicate a floral wreath by creating a faux arrangement along one side. All that's left is to glue everything into place, and you're done! Driftwood or other dried branches make great year-round table arrangements. However, sometimes they can become a bit drab. Consider adding pom poms in a variety of colors to turn the arrangement into a conversation piece. Coasters are an instantly gratifying home DIY to tackle because it can be completed in just a couple of hours. They also make great gifts. This project works best with dense felt balls instead of the fluffy balls with lots of strings. Napkin rings add an entirely new dimension to a dining room table, so don't overlook them. Create more interest to a place setting by making these festive napkin rings. To create a more streamlined look, consider using one neutral color pom pom in a few different sizes. If your children are still young, you might opt to tackle some no-carve pumpkin ideas this fall. This idea stands out because it uses a color not usually associated with fall. You can also use pom poms on pumpkins to create faces or other simple designs. Not every pom pom was created equal. There are a number of ways you can make your pom poms stand out. One of them is by making them into different animal faces. Create a variety then use these to craft a mobile for a nursery. These pom pom party hats will go with most any party regardless of your party's theme. Just be sure not to add too many colors or else your party hats can start to look more like a clown costume. Wall hangings are a great way to fill a large wall space where a small-scale piece of art wouldn't work. 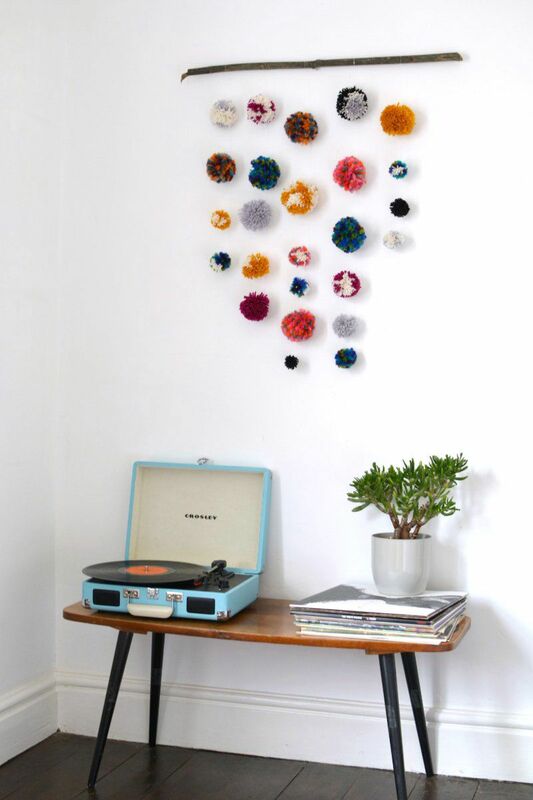 If you have an eclectic style, this pom pom craft would work well in the main living space. If not, consider using it as a mobile or piece of decor in a child's room. Monograms are popular home decor accessories that come in a variety of styles. This particular monogram would work well in a child or teenager's room. The added bonus of this project is that the monogram was transformed into a piggy bank. Hand-woven rugs aren't the easiest to tackle, but the end result is worth the added effort. You end up with a completely one-of-a-kind piece that speaks to your personality. Adding various textures and pom poms creates an eclectic look that would be very hard to find in a store. Learn how to create a blanket that looks like it's out of an Anthropologie catalog by getting creative with pom pom edging. This blogger actually upcycled a drop cloth, which made the project that much less expensive to complete. You don't have to be a seamstress to tackle this pom pom project. Simply purchase some pom pom edging and use an easy hand sewing technique to adhere the pom poms to the bottom of some patterned shorts. If you don't have a green thumb, consider crafting this fun, light-hearted cactus using yarn pom poms. Display it on your desk or gift it as a child's toy. Straw and pom poms are a great combination for a beachy vaction-worthy purse, but they can get expensive. This pom pom craft uses a placemat to create the base of the clutch, which is then embellished with pom poms and other ribbons. This rug project is easier to create than the woven one we featured earlier, and it will be one of the softest things you've ever stood on. For best results, keep the rug neutral and add a few pops of color here and there. 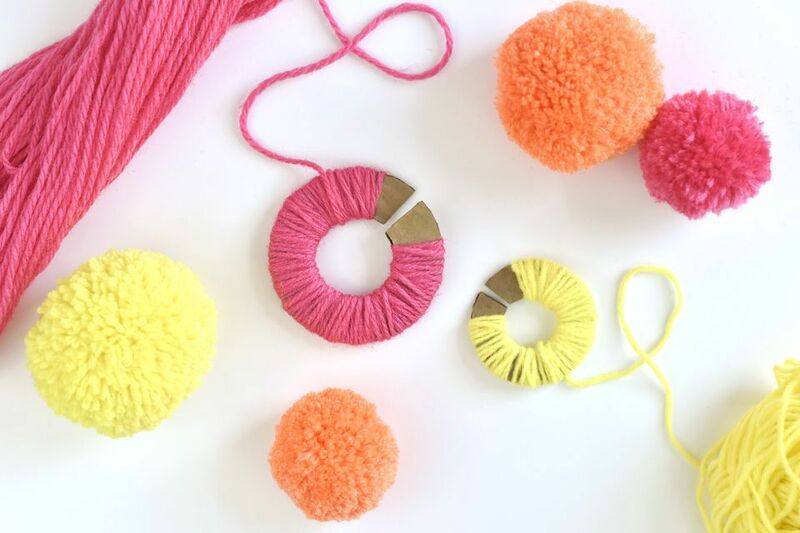 This pom pom DIY project is so simple and functional that anyone could benefit from making one. Use it as a keychain that will help you find your keys easier, or create one to hang on the side of your purse for decoration.